Several hundred years ago, long before there were states, the Peacemaker was born. The Peacemaker carried a message of peace during a time when five tribes in the northeastern part of North America were often at war with each other. The tribes suffered greatly because of lost lives. As the men fought & died in battles, there were fewer people to gather food for the tribe & tribes often went hungry. The legend says that Hiawatha, a good man of the Onondaga Nation, was chosen by the Peacemaker to help the five tribes stop fighting with each other to make life better for all the people. He gathered all the chiefs of each of these tribes and took one arrow from each chief. He held up one arrow and broke it. He told the people that it is as easy to break that one arrow as it is to break the rest of them, if they are not united. He explained that tribes working together in peace makes all of the tribes strong. He then asked each chief if he would help his tribe to stop fighting. When the chief agreed, he gave him a new arrow. When all the chiefs agreed, he took their new arrows and tied them together in a bundle. He then passed the bundle around and asked each chief to try to break the bundle of arrows. They could not break the bundle. Hiawatha then explained that the Nations working together in peace are like the bundle and cannot be broken. When peace had successfully been spread among the five nations, the people gathered together to celebrate. They uprooted a white pine tree and threw their weapons into the hole. 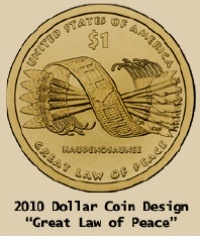 They replanted the tree on top of the weapons and named it the Tree of Peace, which symbolizes the Great Law of Peace that the five nations, collectively known as the Haudenosaunee came to live by. 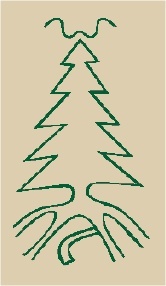 The four main roots of the Tree of Peace represent the four directions and the paths of peace that lead to the heart of Haudenosaunee territory, where all who want to follow the Great Law of Peace are welcome. At the top of the Tree of Peace is an eagle, guardian of the Haudenosaunee and messenger to the Creator. ACTIVITY: Have the class create a “Tree of Peace” in the classroom (use construction paper for the tree). Brainstorm a list of ways that everyone in the class might get along better (no mean words, bullying, etc.). Agree to “bury” actions and words that create a negative environment.